Here is a truth about me: I have never tried to imagine what a severed horse's head would look like, sliced clean into longitudinal sections, splayed and set hard with plastic. This is a small comfort - if I had, I would probably be insane. Nevertheless, I shall not need to imagine such an equine aberration because here it was - distended tongue, cauliflower brain - surreal yet unmistakable and utterly queasying. Anyone familiar with Gunther Von Hagens' innovations will know it takes a strong stomach to appreciate his work. The gutsy German professor presents our most intimate selves as the blackly macabre - flayed or unpeeling corpses with none of the dignity of the dead; posing as poker players, made up like pirates, or clutching hopelessly at their own entrails. This dark comedy has blurred the distinction between anatomist and shock artist and amid the controversy, produced many morbidly curious fans. As the name would suggest, Animal Inside Out represents a departure from human anatomy. But it leaves behind too, some of the flamboyancy of the older, notorious Body Worlds project. Most of the subjects are positioned as you might expect to find them in their respective habitats: a giraffe galloping, a bull rearing, and fish, well, swimming. Further, being housed in the Natural History Museum - brimming with old bones and wooden cabinets - the exhibition benefits from those musty qualities of tradition and knowledge. And indeed there is much to learn, with displays about the taxonomy of molluscs for instance, or a step-by-step explanation of Von Hagens' famous process of plastination, which remains impenetrable after several readings. 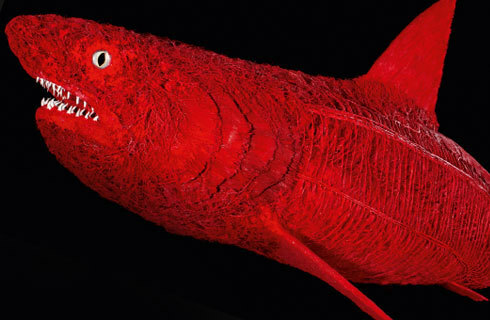 It is the specimens of course which make this show so compelling - a skinless Lowland Gorilla revealing the mechanics of its fearsome muscular system, or the Porbeagle shark, distinguished entirely by millions of bright red capillaries - both a fabulous reinvention of the Hirst shark and surely the wonder of any budding biologist. There are giants too: a colossal three-and-a-half tonne Asian elephant is dizzying to behold. And there are elements of Von Hagens' characteristic humour, as a painfully sheared sheep settles upon its woollen fleece. The exhibition runs until the 16th of September, so go check it out for yourself. Why? It's freaky and fascinating in equal measure.